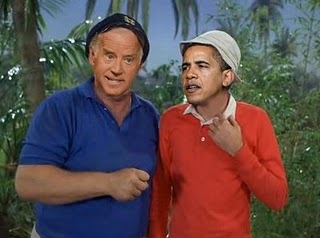 Too good not to post…..
Of course, in this case, the Skipper and Gilligan don’t want to “rescue” us, they want us to live permanently on the island under their rule. Did Gilligan bow to those island natives they discovered on the island in a gesture of subservience? Did Gilligan/Skipper duo confiscate Mr. Howell’s money and redistribute it to the less fortunate Professor and Mary Ann? Did Ginger (from Hollywood) fawn over the “wise and calm” Gilligan even though the facts show that view to be 180 degrees out of phase? Was the Professor’s island research funded by the Gilligan/Skipper regime and therefore, his scientific “research and results” skewed towards the wants of the regime? Did the Skipper blame the fate of the shipwrecked crew on that nasty Skipper that preceded him on the ship? Was Mary Ann, from flyover country, deemed by Gilligan a radical, hateful, domestic terrorist for her traditional American upbringing and views? Why weren’t black Republicans or conservatives invited to the MLK March on Washington commemoration in DC today? Obama hails the results of good works of Islam in America….